Early on in the film, Frank Walker (George Clooney) refers to the future as scary and it's hard to argue this. I love living and experiencing the beauty of this word and I never want this to ride to end, but over the past few years my mental priorities have changed and I worry about myself far less. I look at my daughter and I want to believe in a planet that is thriving rather than falling apart. I want to glimpse into the future and see images of comfort. I want to wrap my arms around a better life for her than I ever could have dreamed of. A better tomorrow. 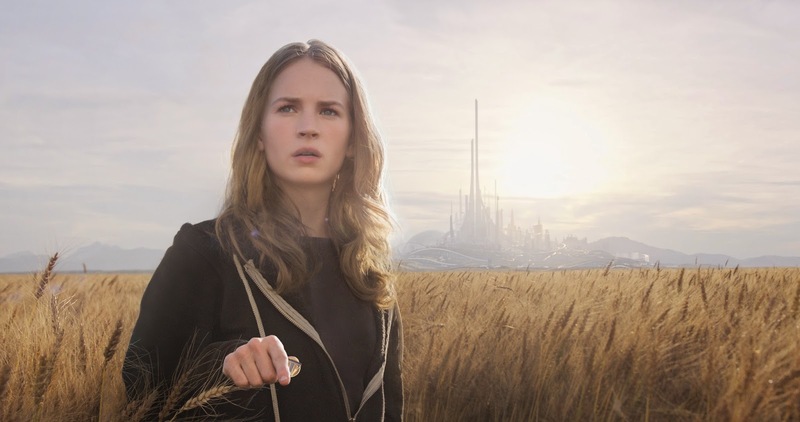 Tomorrowland is a film made up of huge ideas and grand ambitions and it succeeds more than it fails, but it does get bogged down by its flaws at times. The first half of the picture had me soaking in a warm feeling of nostalgia, as it really felt like a Disney release I would have seen growing up and young me would have been lost in the wonder of it all, and it's not lacking in that department. There is wonder, magic and concepts abound and I was flying high with optimism over the direction this story was taking. 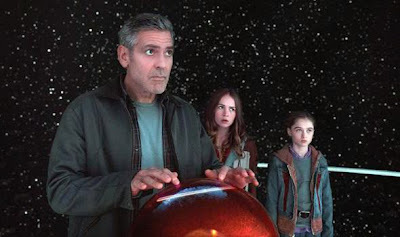 I really enjoyed the performances, as Clooney and Britt Robertson as Casey Newton have a solid chemistry together on screen and their characters seem to promise us a memorable and wild adventure, and it mostly delivers. Unfortunately though, the ride gets a bit bumpy during the second half. I could be completely wrong, but I think I have an idea of what the problem was here and it was essentially the pacing. Perhaps the studio wanted to make sure the entire film fit nicely into a two hours at most package, fearing that the target audience of fun for the whole family would find anything longer daunting and thus stay away. The first hour really brought us into their world and developed the characters well, as it moved at a pace just brisk enough to keep us entertained but it never felt exhausting. The second half, however, seemed to want to rush the entire vision of director Brad Bird and company to a speedy conclusion, which is tough to do when you have so many big ideas to connect together. A lesser concept with little to say and this would be more forgivable, as plenty of spectacle first, narrative second films can rush their way through action and a plan to save the world and lose little in the translation from page to screen, but here an important message is being conveyed. The media blasts us with rhetoric and images that mean to fill us with dread and fear of an inevitable demise, and it's challenging to not succumb to an apathy induced by hopelessness. 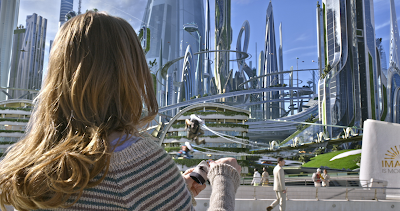 Tomorrowland wants to remind us that it isn't too late. If we refuse to accept that nothing can fix this, that we can push greed and personal selfishness and corporate interests to the side in search of the greater good we can still let our children live in a better tomorrow. We need dreamers, believers, and optimists who will never give up as long as their is a chance to save this world. 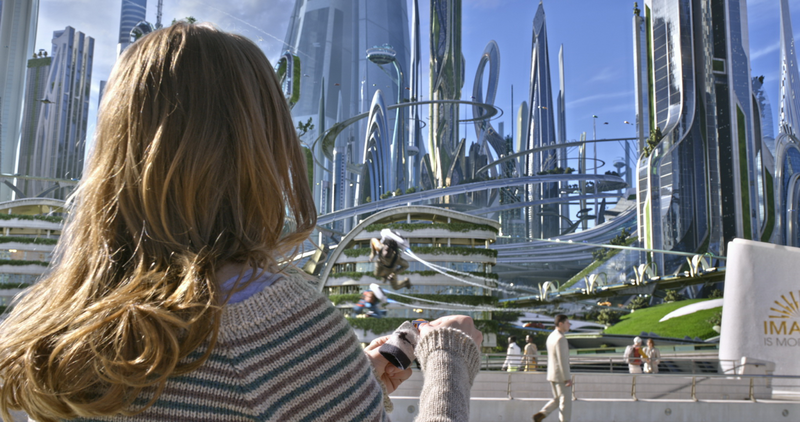 We need those who want to live to see Tomorrowland. Had the film let the overall theme breathe a bit more it would have resonated deeper, but overall I will still take an ambitious miss than a safe and lackluster hit.